We spent almost three weeks driving through much of New Zealand's North and South Islands. It was one of our favorite places, with the beautiful countryside, ever-present adventure activity opportunities, and the extreme friendliness of all the people we met. The only imperfect component of our time in New Zealand was the weather -- our visit coincided with their late Autumn which meant consistently cold, rainy days (though we did eek out some sunny days on the South Island). The only good side to the weather was that it resulted in no crowds, and tons of rainbows. We loved New Zealand, highly recommend it, and plan to go back during the high season one day. English speaking TV channels (in hotel): plenty! 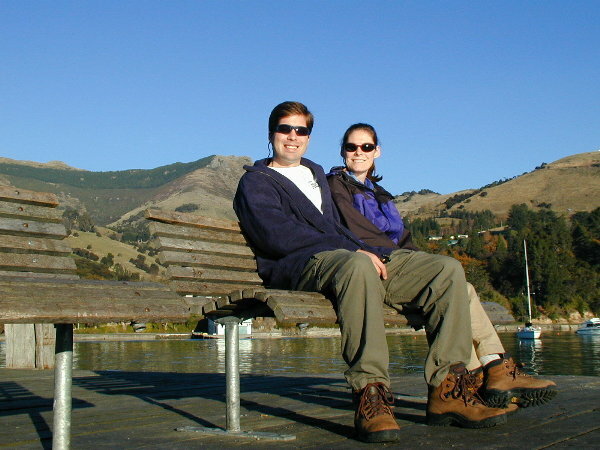 We consider New Zealand the best tourist location of anywhere we have been. The country is super well organized, with consistently well-equipped and helpful tourist information centers in all of the major towns, an endless supply of organized adventure activities, inexpensive accommodations, excellent roads, and a no-tipping-oriented service approach. Every New Zealander we met was genuinely courteous, nice, honest, and never made us feel like they were taking advantage of us. For the first time in such a tourist- active country we did not feel like a money-producing object. With so many fun things to do in the country, we often forgot that there were only 3.8 million people in the whole country. New Zealand has two major islands; North Island and South Island. We flew into Auckland on the North Island, drove 1400 km through the North Island for 8 days, and then visited the South Island for 11 days, driving another 2400 kilometers. We had been told that we should spend most of our time on the South Island, and once we had been there a few days we understood why. Although we mistimed our visit to New Zealand, arriving at the worst time of year -- rainy and cold every day in the north, and very cold in the south -- we did time our visit to the South Island fairly well. While we were on the North Island we heard weather reports that the South Island was experiencing horrendous snow and hail storms, closing many of the roads in the mountains. But when we reached the South Island the weather had turned to nice winter days, mostly sunny but cold. Since we drove so many kilometers we saw much of the New Zealand countryside. It is beautiful; green farm land, mountains, lakes, and coastline. The following describes what we did and saw on our travels through New Zealand, generally in the order in which we traveled. We have underlined all the activities we did or tried to do in the various towns. We flew into Auckland from Sydney, rented a car, and stayed in New Zealand's largest city a day and a half. We started to do the 'coast to coast' 20km walk across the town of Auckland, but a vicious storm forced us to take a bus back to the hotel. We went to see the 'NZ Beatles', a pretty bad (but fun, nonetheless) Beatles impersonation band, visited a casino, and ate late night food -- it was great fun! We attempted to go on a boat trip to swim with dolphins and watch whales, but it was canceled at the last minute because of nasty weather. One of the big tourist attractions in Auckland is the Sky Tower, a huge concrete tower that is supposedly the tallest structure in the southern hemisphere. We took in some great views of Auckland and its amazing coastline and green fields. After Auckland we drove up to the Bay of Islands area mainly to swim with dolphins, and go deep sea fishing. The area is famous for the hundreds of islands within sight of the shore. We chose to stay in the town of Paihia, because it was a cool-looking one street coastal town, and it offered everything we wanted to do. We went fishing the morning after we arrived. We were bottom fishing at a depth of 150 feet, mostly for snapper. Although the swells were 10-15 feet and the boat rocked continuously, we enjoyed it. We caught many fish, although none were very big. We did have some excitement when Dan hooked a 'Thresher Shark' (without meaning to, of course) and it immediately hit the surface and skimmed across it often jumping out of the water. It pulled tons of line out and was impossible to reel in. Dan played the shark for about 10 minutes then it snapped the line. The captain estimated that the shark was about 5 feet long (with a tail of more than 10 feet). Apparently it is almost impossible to land a thresher shark without letting it pull the boat and tiring itself out, and we could not do that as we were anchored to the reef. Oh well, the memory of "the one that got away" is still exciting. 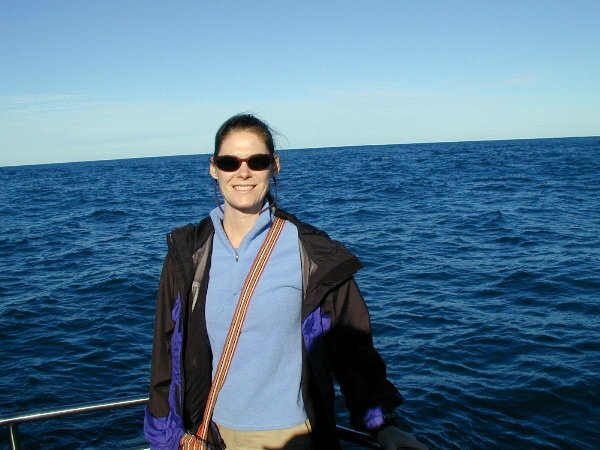 We planned to go swimming with the dolphins either that afternoon or the next morning, but we were exhausted after 4 hours on the rough seas that day, and the next morning it was even rougher and colder and raining, so we decided to wait until the South Island. Our long drive from Paihia, down the west coast of the North Island afforded us dramatic views of green farmland, mountains, the long coastline, and many huge rainbows. 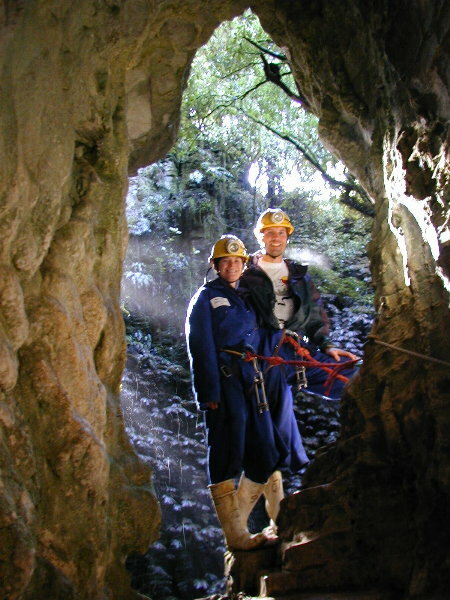 We visited Waitomo (actual town of Otorohanga) to go caving, see the infamous 'glow worms', and possibly do some abseiling (rappelling). We called the main (or only?) vendor as we were driving south, trying to decide whether to go to Waitomo or Rotorua first. The woman at the Waitomo booking office was so nice we decided to head to Waitomo. We reached the town late that night, and met at 7AM for 100 meter abseiling into a cave. The guides were very professional and as we rappelled the 100 meter drop in our harnesses we felt very safe, even though they joked about forgetting to tie the harnesses and how the last group had fallen from that height, etc. We walked through the caves, climbing over and ducking under rocks, and over water as we ventured towards the surface. In one cavern we turned out our headlamps and enjoyed the hundreds of glow worms on the ceiling, making for a great 'star show'. The light comes from flea larvae in their cocoons, creating light to attract food. They exist in most of the caves in the area, and are a quite cool sight. In the last ascent toward the surface, we had to climb a 120+ foot ladder straight into the ceiling. 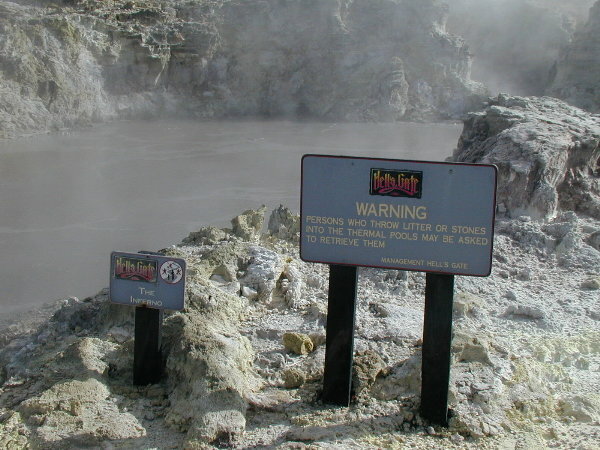 Rotorua is one of the most active geo-thermal areas in New Zealand, which means steam escapes from 100's of areas around the town. It has also been called 'Roto-vegas', but we thought it was more like a huge entertainment center with every variation of adventure sport and attraction you can imagine. Given the terrible weather, we were a little limited on what we were willing and able to do. 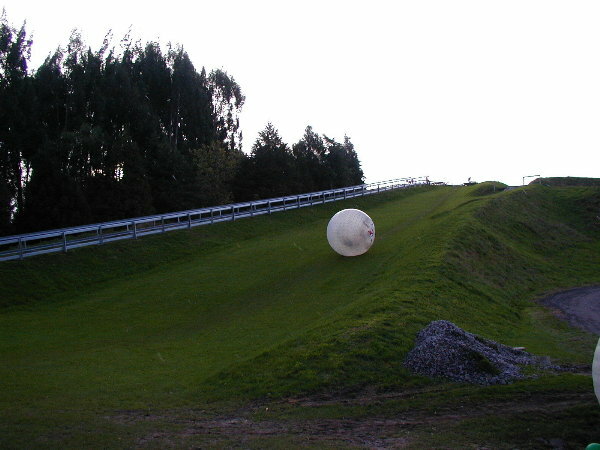 Dan went ' zorbing' (see www.zorb.com) which involved climbing into a 15-foot diameter inflated ball and rolling down a big hill. 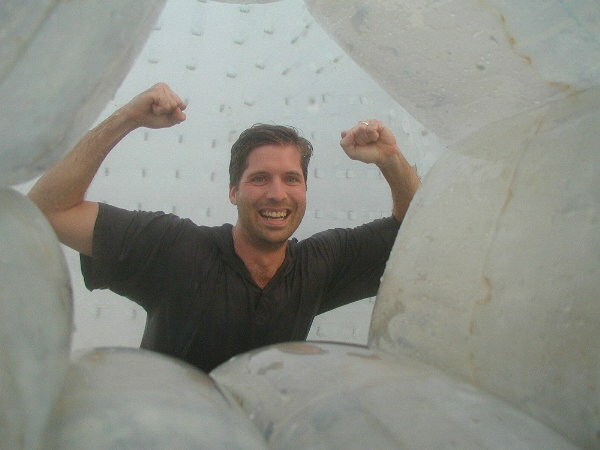 Inside the ball with Dan was just enough (warm) water to make it a slippery sliding washing machine ride. It was truly exhilarating even with the extreme chill outside. Even though it was cold and rainy we decided to try out the luge ride. We rode a gondola to the top of a mountain, then road a street luge down an amazingly steep route to a chair lift to the top for another ride. At over 30mph we 'caught air' over some great jumps and almost lost it around many sharp turns. We giggled like kids at the amazing time we were having, even in the bitter wet cold. We visited an active geo-thermal area, Kauri Park, in the middle of town and enjoyed the boiling mud and many steam vents. Just outside of Rotorua we visited another geo-thermal area called Hell's Gate, where there are many different types of pools, steaming rocks, vents and holes in the ground which sprayed steam tens of feet into the air. We wanted to go trout fishing in Rotorua but the weather was terrible, so we decided to stop in Taupo on our way south on the afternoon we left Rotorua. The weather was not too bad, so we walked to the marina, hired a captain for a couple hours, and went fishing for rainbow trout. We took the option of 'harling' which means we trolled and 'jigged' for the whole two hours (vs. letting the captain drop the lines and just waiting for a strike). Although it was the worst time of day at the worst time of year to fish, we caught one fish each. Kristen caught the first fish, a 1+ pound rainbow trout, within 10 minutes of being on the water. And, just as we were heading in, Dan caught a 5+ pound trout. The captain thought Dan had hooked the bottom given the angle of the rod and how much line was being pulled out. We enjoyed the fishing experience, and as with everyone else, the captain was very nice. He was overjoyed and grateful when we told him that he could take Dan's fish home. He cautiously asked us whether we were sure, and even mentioned that a restaurant in town would cook it for us, but then he smiled warmly and almost shyly when we told him again that we wanted him to have it. After fishing on Lake Taupo, we wanted to make it to Wellington, but it was storming like crazy, so we stopped in the closest town that had any lights or buildings in it -- Taihape. The town is tiny (no stop lights, one gas station, four motels), but we happened upon a great little motel. We drove in and asked the gentleman at the desk if we could look at a room, and he had only one left, a triple. He showed it to us, but saw by our expressions that we had had a long day, and probably wanted a room where we could watch TV from a big bed -- we confirmed his suspicions. He went back and looked at the ledger, and decided to bump one of his 'regulars' (a trucker we assume) and said he could share a room with someone else! He then explained that he had four full time movie channels, and also gave us a list of over 1000 additional movies we could watch on our VCR in the room -- what a great motel, and perfect for what we needed, as it rained all night! At around 11PM there was a very loud alarm coming from somewhere in the town, similar to a tornado warning siren. After about 10 minutes of the loud noise, we opened the door, and looked out into the storm to see if anyone else was concerned about the alarm, but not a soul was moving, so we also just ignored it. Our goal for getting to Wellington was to take a ferry to the South Island, and to see what is considered the best museum in New Zealand. We arrived in Wellington mid-day, with just enough time to take the cable car to the top of the city and see great views of the harbor (the tourist 'must-do'), then to visit the Te Papa museum. The museum was extremely interesting (even Dan thought so, afterward). And, only in New Zealand, although there were five floors of exhibits in the beautiful building on the waterfront, the museum admission was free! Te Papa is deservedly well known as having a great collection of Maori art and artifacts, as well as portraying the history of the Maori people. Sadly, the history of the Maori people with the white settlers in New Zealand is remarkably similar to the history of the Native American Indians and the white settlers in America. The museum also has some great technology exhibits on the future and the past, as well as some cool earthquake and volcano exhibits. We realized why there had been three earthquakes in New Zealand that week -- the entire country is on a fault line. We realized then that the alarm in Taihape could have been an earthquake warning. Ah, ignorance truly is bliss! The future technology exhibit was very impressive, with a computer animation area which captured our real-time images and included them in an animated show. The coolest part of the exhibit was that our body movements directed the movements of our images on the screen. We took the 3 hour ferry from Wellington to Pickton on the South Island. Fortunately, it was a beautiful day, and the scenery of the Wellington harbor, and the hundreds of tiny islands around the South Island was awesome. We did miss some of the scenery because we opted to watch a first-run movie (Finding Forrester) on the very well-equipped ship. We picked up a new rental car in Pickton, and drove to Kaikoura on the east coast. 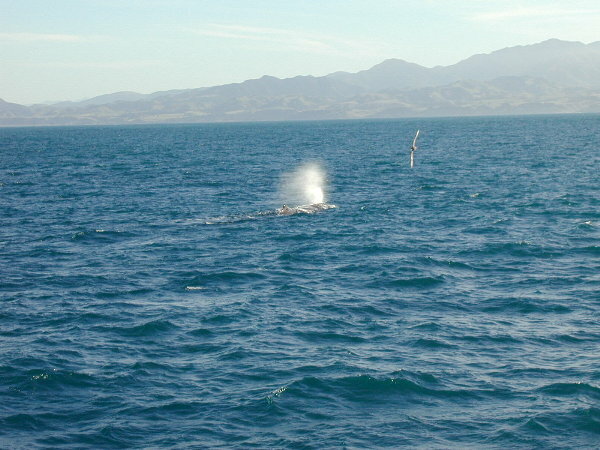 Kaikoura is known as the best place in the world to see a sperm whale. Because we had missed the whale watching season everywhere else we had visited on this trip, and had been prevented from whale watching on the North Island by bad weather, we were excited to do some whale watching. We decided that we would also spend some time there and go swimming with dolphins and maybe even swim with sharks (in a shark cage!) We arrived in the afternoon, and the rainy weather was clearing up so we thought we might get lucky. No such luck. There were gale force winds on the sea, and no water sports for the next day, or the next day, or probably most of the week. So, once again, we missed out on the opportunity to see whales. After two days in Kaikoura, and weather forecasts for heavy wind for the next 5 days, we decided to move on to somewhere with better conditions. We checked the weather forecast for the rest of New Zealand and learned that the west coast was having unseasonably great weather, so we headed in that direction. 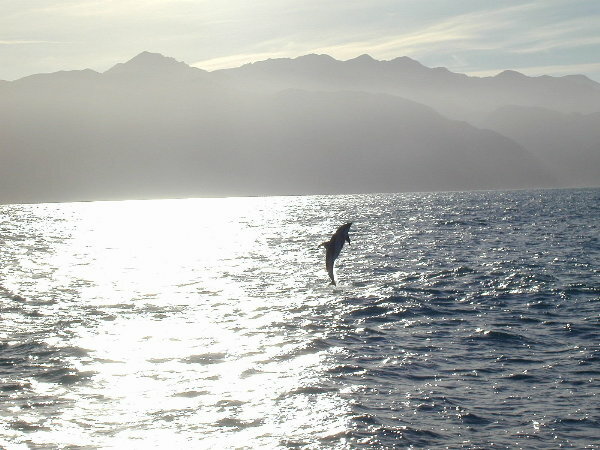 (See Kaikoura -2 below for our more successful second visit). We were once again amazed and pleased at the beautiful views as we drove through the mountains and plains from coast to coast of this beautiful country. A week earlier there had been a huge snow/hail storm through the route we drove, and there were still many warning signs about the road conditions, backed by a frosty and steamy landscape. Franz Josef is a tiny town on the west coast, existing mostly to support tourism around the Franz Josef glacier. This glacier is the fastest moving of New Zealand's glaciers, moving up to 7 meters in a day. Of course, sky diving, fishing, hiking, sightseeing tours, etc are offered as in most towns in New Zealand, but the glacier hikes are the focus. We chose the glacier heli-hike, in which a helicopter dropped us off in the middle of the glacier, we hiked on it for a couple hours, and the helicopter picked us up higher on the glacier. We could not have picked better weather for the activity -- perfect blue sunny skies allowing us to wear only light jackets on the hike. We understand that it rains (or snows) 180 days a year in Franz Josef, so we were extra lucky with the weather. Although we had to do the hike as part of a group, traversing the many cliffs, holes, and crevasses of the glacier was quite cool. Because it was winter, the glacier was not moving very fast, and we missed seeing any falling ice "rocks" as the glacier moves. On the way out of Franz Josef, we visited the nearby tiny town centered around Fox Glacier to see the reflection of Mt. Cook and Mt. Tasman in Lake Matheson at sunset. We got to the lake a little early, and did the 50-minute hike to the viewing island, and watched as the first clouds we had seen on the west coast got in the way of a perfect picture. But the reflection was very cool and we could see why so many postcards were created from that view. The light of the setting sun illuminated the mountains beautifully, but as we drove toward Queenstown from Fox we realized we would have seen a far better sunset with the light clouds along the coastline drive -- we missed the sun setting but caught the blazing orange color along the horizon as we drove the coastal highway. After Franz Josef we decided to head straight for the "huge" metropolis of Queenstown (population 7,500! 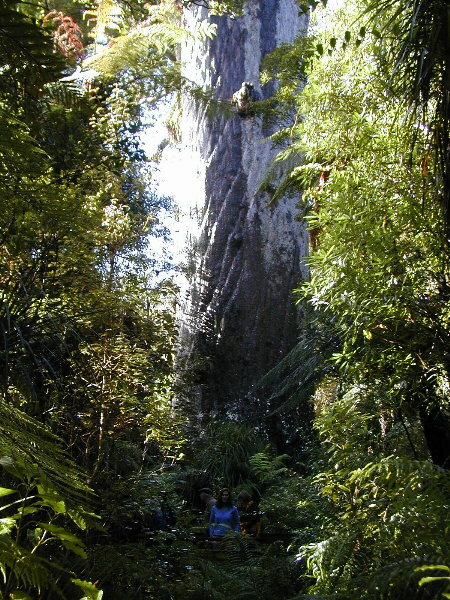 ), so that we could enjoy the great weather in what is considered the adventure capitol of the South Island. We decided to stop over one night in Wanaka, about 100km from Queenstown. Wanaka is a small ski town positioned in the mountains on a beautiful lake, much like Queenstown, only smaller. 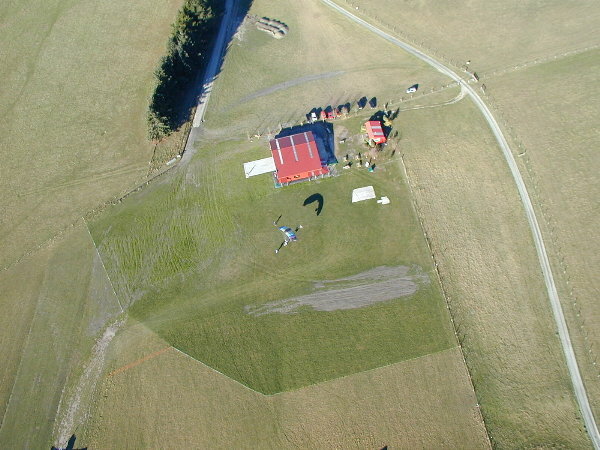 We decided while in Wanaka, that we would go skydiving, 'just because'. We compared options in Wanaka and Queenstown and decided to head on to Queenstown to do it -- the big difference was the level of photo/videography offered in Queenstown. 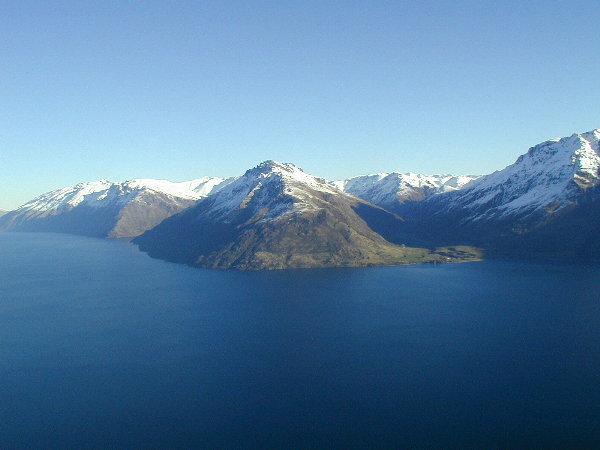 Queenstown is one of the largest towns on the south end of the South Island. Once we got the bug of going tandem sky diving, we decided to do it the first day we arrived in town, wanting to take advantage of the beautiful sunny clear weather, and not wanting an excuse not to do it to present itself if we waited. 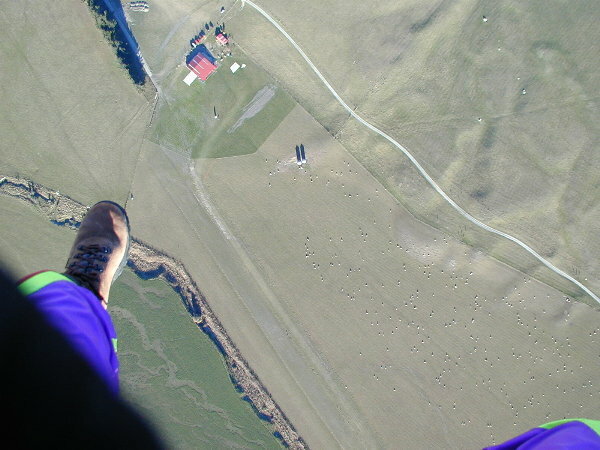 We drove to the sky diving office in the middle of sheep farms/fields 10km from town, and spent only about 10 minutes of preparation (signing waivers, putting on the jumpsuits, etc) before we were in the plane on our way to 13,000 feet. We decided to capture the experience on video, so there were 6 of us in the tiny seat-less compartment of the jump plane: the two of us, each of our diving guides, and a videographer jumper for each of us. It was crowded but the quiet 20 minute flight to the right altitude went quickly. We were surprised at how little they said to us about what to do during the jump, any safety measures, expectations, landing, or anything. Each of our guides had jumped 6-8 times that day already so we guessed they were tired and just did not bother with formalities. In a matter of moments, they opened the door, Kristen slid with her guide and videographer to the door and were gone, then Dan quickly followed -- very little time to think! The freefall portion of the jump lasted 50 seconds, and since we were told that we would reach speeds of up to 200 kph(!) we estimate that we fell for approximately 7,000 feet! The actual jump experience was very different for each of us. 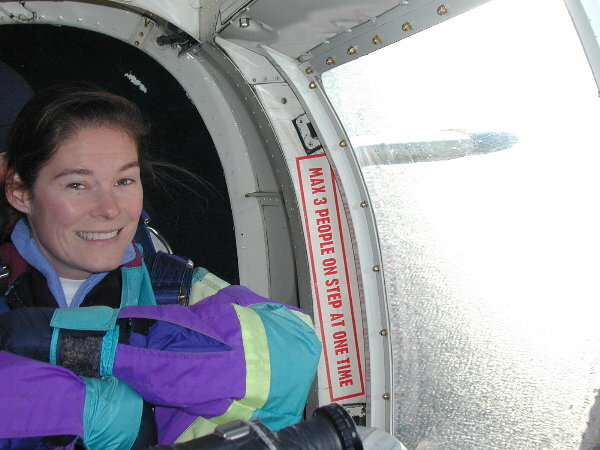 Kristen had a hard time breathing during the freefall because of the extreme cold and the "wind" created by the rate of descent. For her the freefall felt like it went on a long time, and then she loved the peacefulness and the view during the 8-10 minute parachute ride to the ground. Dan loved the freefall and felt like it went super quick, but the vice-like grip of the harness on his thighs made the parachute ride almost unbearably painful. He took several pictures of the scenery and of Kristen landing to help pass the time. Although we did not notice it as much as our guides, the extreme cold was quite piercing on the exposed skin -- the guides covered their faces for much of the freefall. We are both happy to have done it, and we got a huge adrenalin rush from it, but we probably won't feel the need to do it again. One of the reasons we wanted to go to Queenstown, was to experience the Shotover River Jetboat. During this ride a jetboat rushes headlong down a narrow river gorge, doing 360° turns and speeding within inches of huge boulders lining the river. The jetboats typically run every 15 minutes with people on waiting lists during the high season. During this very cold time boats only run about 5-10 times a day. We bundled up with everything warm we still had with us, used our hoods and face covers from our jackets. As we donned the ponchos and lifejackets provided by the operators, we watched the very wet, cold people on the ride before us climb out of the boat. As we got on the boat and sat right behind the driver, we noticed that the back of his seat, jacket, and life jacket were covered in ice! But as usual, he was very nice and professional and took us for an outstanding ride, sliding to within an inch of the huge overhanging rocks at full speed, and doing 8-10 spins in the river, creating temporary rainbows and spraying all of us with the freezing river water. Our boat was filled with kids and their parents, and everyone loved the ride, but we think we giggled more than all of them. If it had been summer, we would have done it again, probably sitting in the front seats for a different effect. 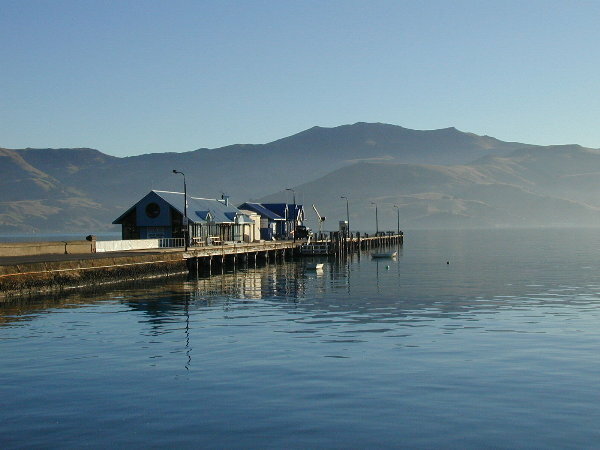 On the town's main pier is Underwater World, a submerged observatory which, through a glass wall, provides a view into the underwater life of Lake Wakatipu. On the glass wall there is a little box which, for $1, disperses fish food into the lake just outside the window; a unique way to 'feed the fish'. Clearly this box has been there a long time because there are hundreds of 10-20 pound brown and rainbow trout circling right at the window. It was amazing to see the fish so clearly in their natural environment. When we put in a dollar, several huge eels came up from the bottom of the lake to join the feeding frenzy. Given this scene we figured it would be a thrill to go trout fishing in the lake -- they do not allow fishing anywhere in the bay or around the pier, so we chartered a boat for a couple of hours the next day. Unfortunately, the captain called us at 45 minutes before we were supposed to meet him and said he was sorry but he had to cancel our fishing trip because he had the flu and did not want to infect us. He gave us the name of another captain but he was not available, so we will have to do it on our next visit. We did note, however, that in our few days there, we did not see a single fishing boat on the lake, so maybe it was not the best time of year to fish, anyway. 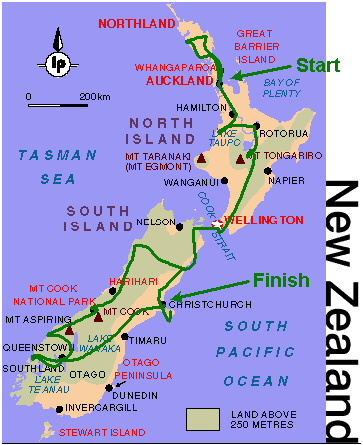 We have drawn the itinerary of our tour of New Zealand the map to the right. We flew into Auckland (see 'Start), drove the North and South Islands, and flew out of Christchurch (see 'End'). 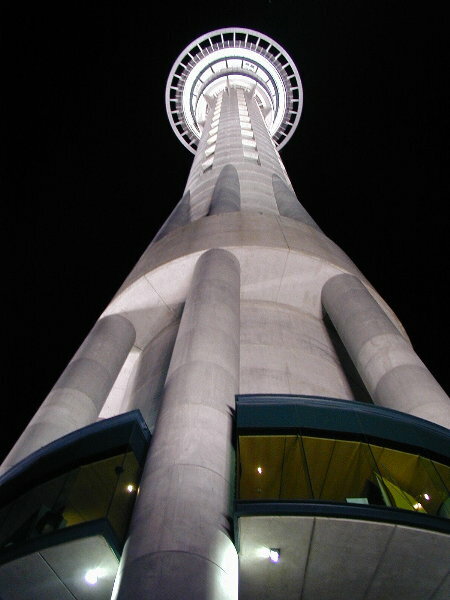 Night view of the Sky Tower in Auckland. Supposedly the tallest structure in the southern hemisphere, it provides great panoramic views of Auckland. Panoramic view of Auckland from the top of the Sky Tower. 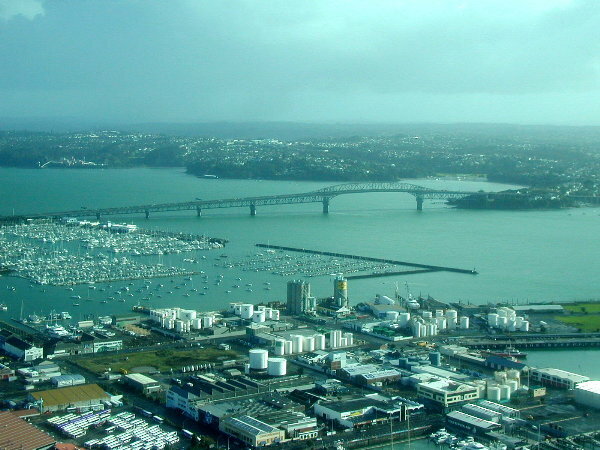 The north bridge provides access to the northernmost part of the North Island. Panoramic view of Auckland from the top of the Sky Tower. 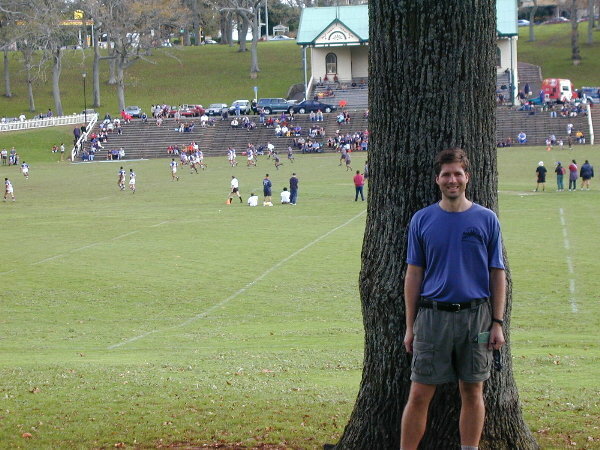 During our coast-to-coast walk across Auckland, we watched a rugby match in one of the parks. 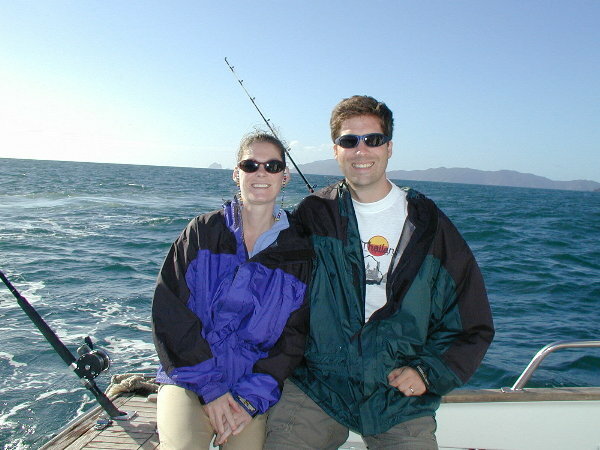 In the Bay of Islands town of Paihia in the extreme north, we went deep sea fishing. No pictures of the many fish we caught only because we were all fishing the whole time so there was no one to take pictures! 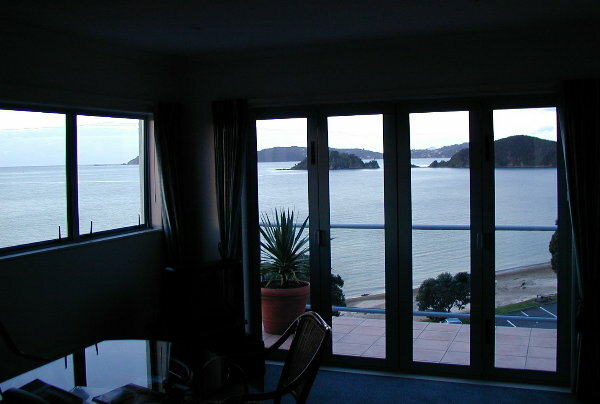 Our view from the outstanding apartment-style hotel room in Paihia, in the Bay of Islands. A view of the countryside along the northwest coast during our drive from Paihia to Waitomo. A huge rainbow we enjoyed during our drive from Paihia to Waitomo. We saw tons of huge rainbows on the North Island. We stopped off on opur drive to Waitomo in the Waipoua Forest to see the huge ancient Kauri Trees. Kristen is standing in front of one of the biggest, which is alleged to be 2000-4000 years old. 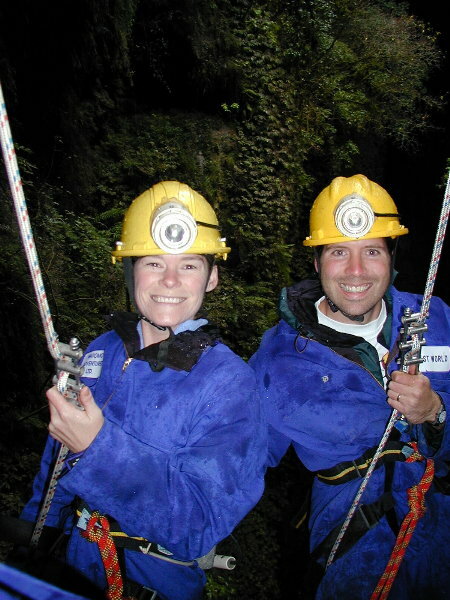 We abseiled 100 meters into the caves in Waitomo. 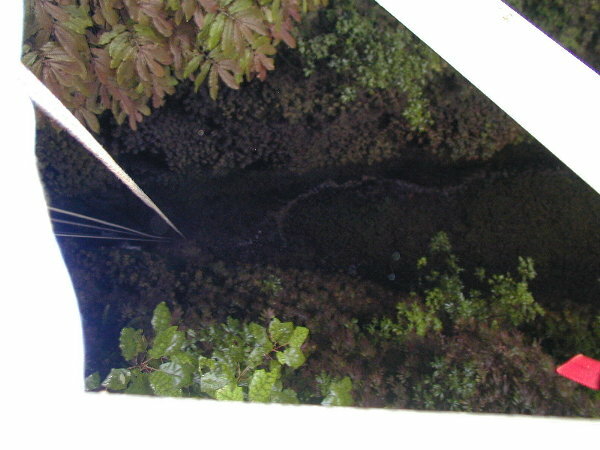 This is a view from the platform from which we rappelled. 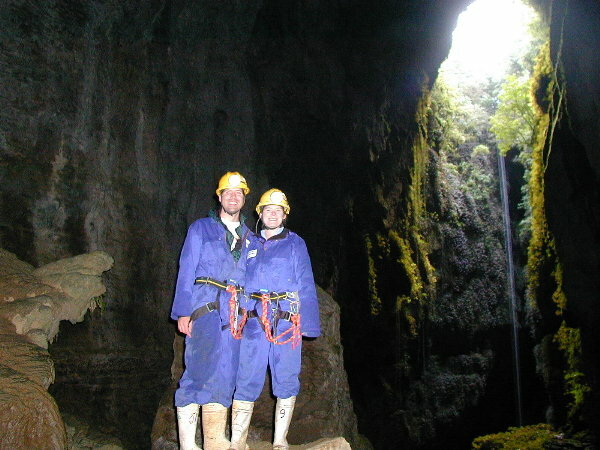 Our guide took this picture as we were abseiling the 100 meters to the floor of the cave. We are standing on the floor of the cave, with the sun shining through the entrance through which we dropped. The distance is quite deceiving -- it really is 300+ feet. 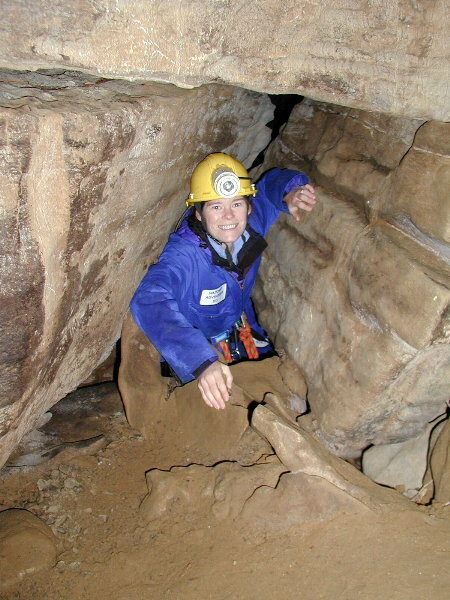 Kristen squeezing through a tight spot as we are climbing out of the cave. 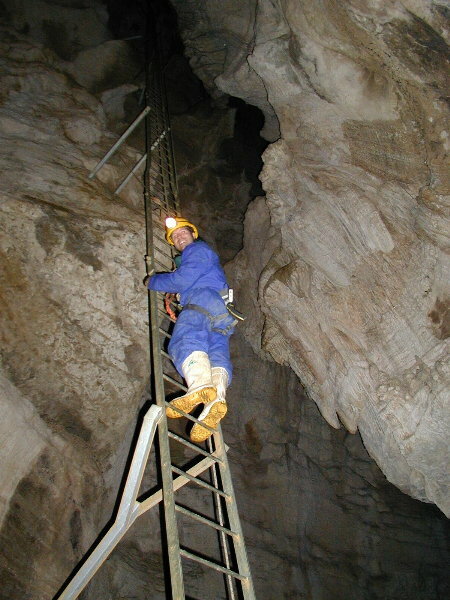 Dan climbing the 120+ foot ladder near the last ascent out of the caves. Stopping at the exit of the cave for one last picture. Our guide was super-friendly and was quite happy to take lots of pictures. A panoramic view of the town and lake of Rotorua, the geo-thermal capitol of New Zealand and the biggest tourist spot on the North Island. We took the gondola to the top of the hill for this picture. 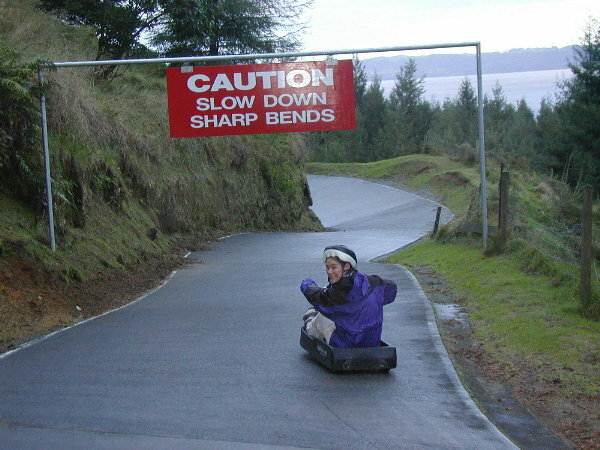 At the top of the hill in Rotorua, we took luge rides in the freezing rain. Kristen looking back before one of the sharp curves. Dan coming off a huge jump on the luge ride at top speed. 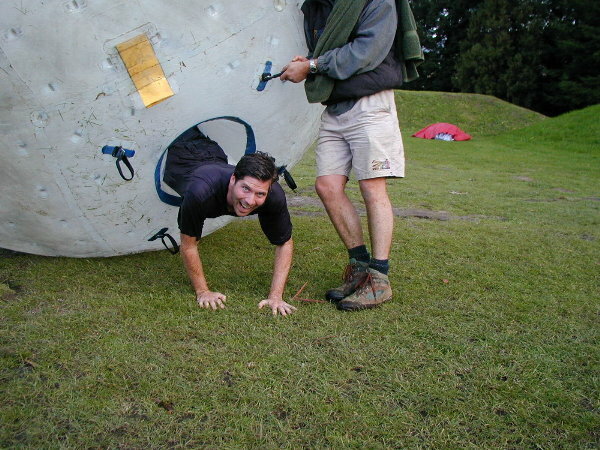 Dan doing the New Zealand sport of zorbing -- tumbling down the hill in a 15 foot diameter ball with 30 liters of fortunately warm water. ...having no control and having no idea when the ball will stop. What a great concept! By the way, it was about 35ºF! Kristen standing in front one of the boiling pools at Hell's Gate, outside Rotorua. The geo-thermal pools boiled at 100's of degrees. Although there were no fences, they used these signs to help discourage people from straying from the paths and to protect the area. 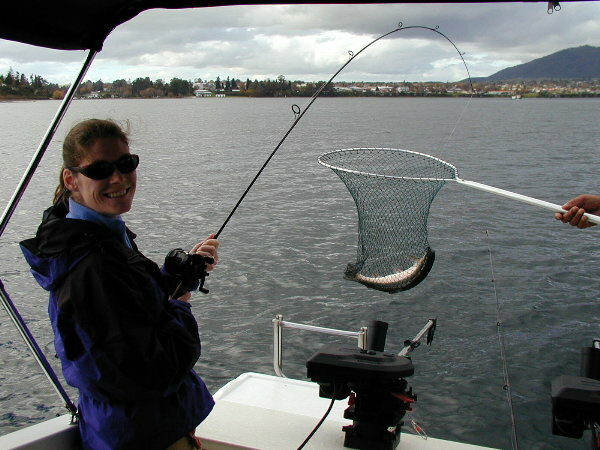 We stopped to fish in Lake Taupo and Kristen caught a rainbow trout in the first 5 minutes on the water. 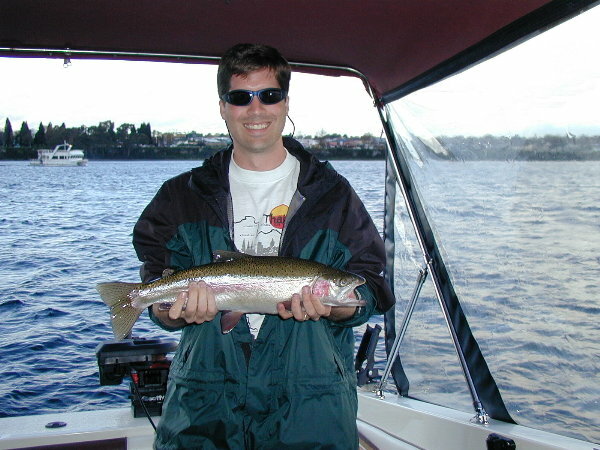 Dan caught a 5+ pound rainbow trout as he was reeling his line in as we headed back to the harbor to leave the lake. 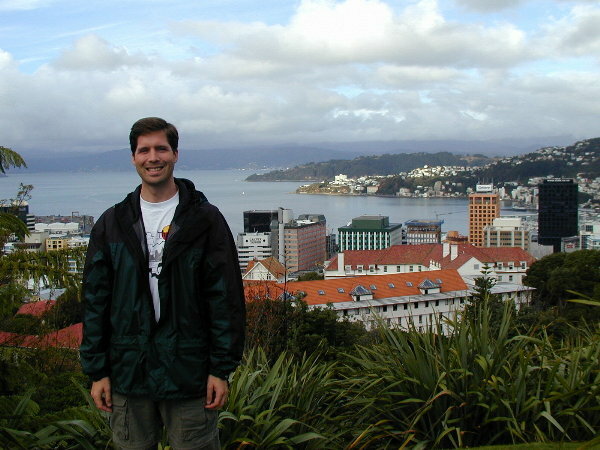 Dan standing on the hill overlooking Wellington, the southernmost coastal town on the North Island (and New Zealand's capitol city). 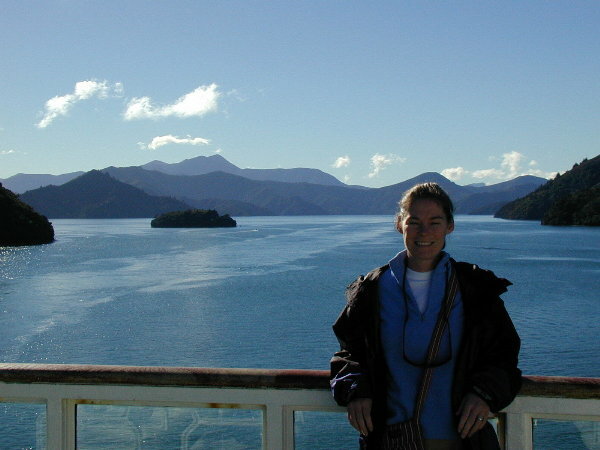 Kristen standing on the ferry with many small islands in the background as we head into Pickton on the South Island. Panoramic view looking north from the peninsula in Kaikoura on the east coast of the South Island. You can see the entire town in the picture. 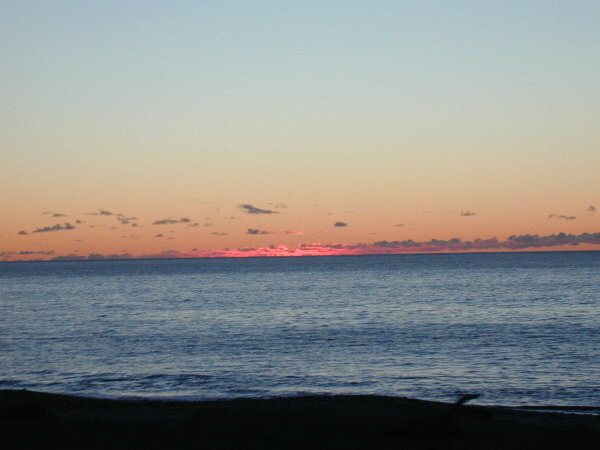 Panoramic view looking south from the peninsula in Kaikoura on the east coast of the South Island. 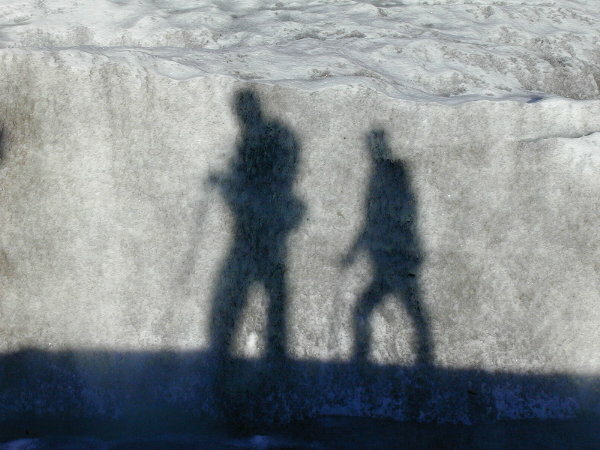 Shadows of us on the Franz Josef glacier as we hiked across it. 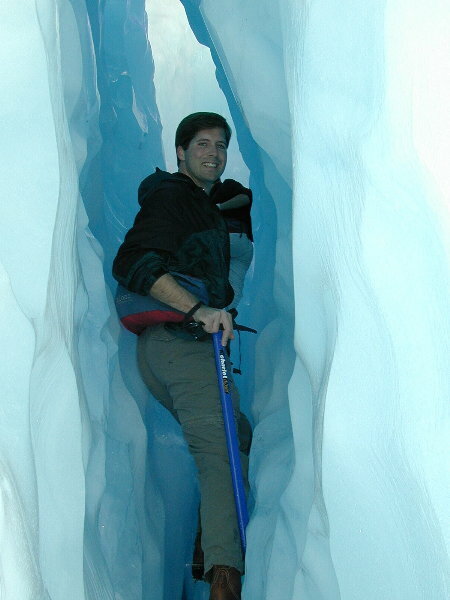 Dan squeezing through one of the many cold and wet tight spots during our glacier hike. Kristen in one of the many ice holes we explored on the glacier. This is out first attempt at a vertical panoramic picture! Mt. 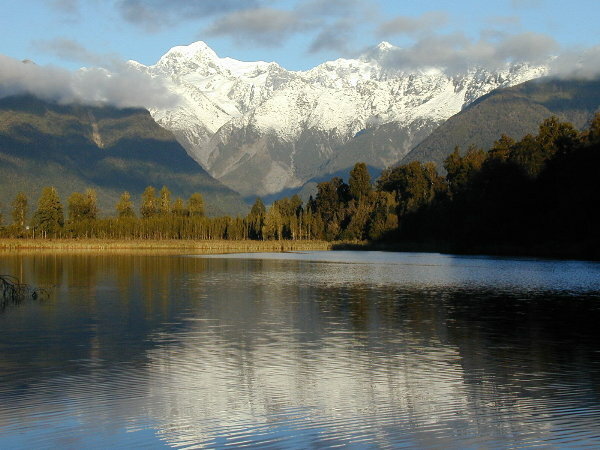 Cook, the tallest mountain in New Zealand, and its reflection in Lake Matheson, near Fox Glacier. 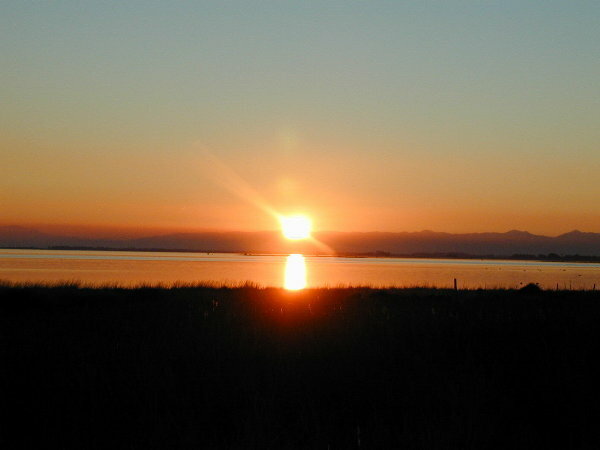 We missed the sunset as we drove along the west coast, but even the afterglow was great. 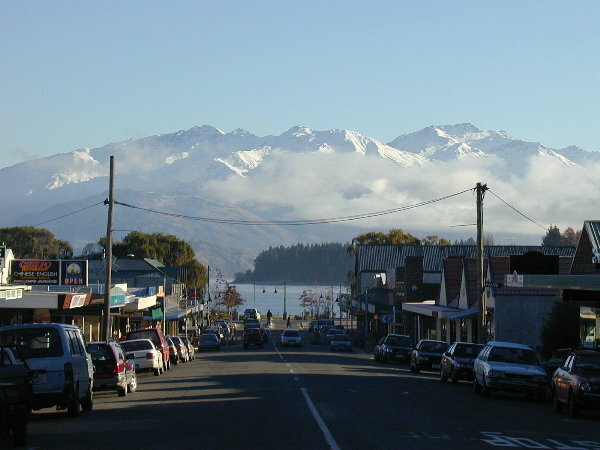 The view along the main street of Wanaka, a small ski town north of Queenstown. Just a small sampling of the millions of sheep we saw. 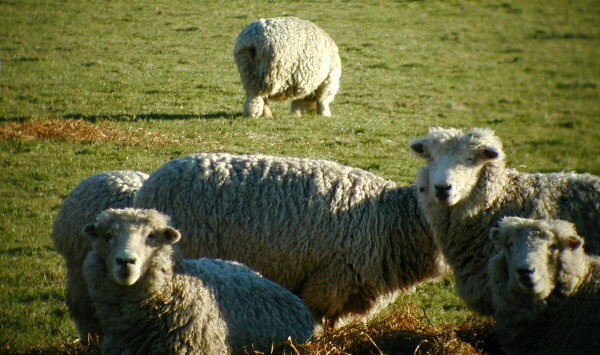 We think we saw about half of New Zealand's 48 million sheep during our drives through the countryside. 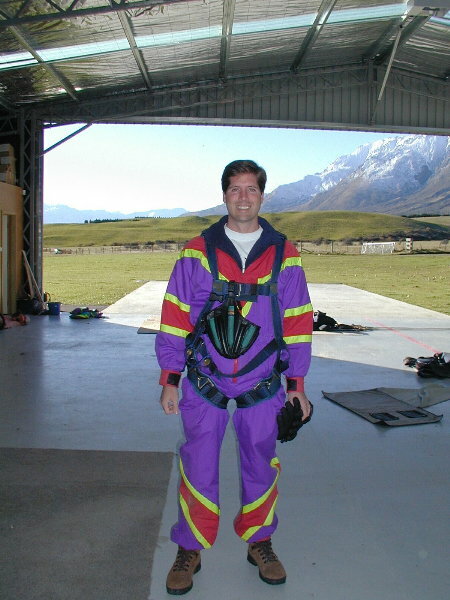 Dan all suited up for his tandem sky dive in Queenstown. 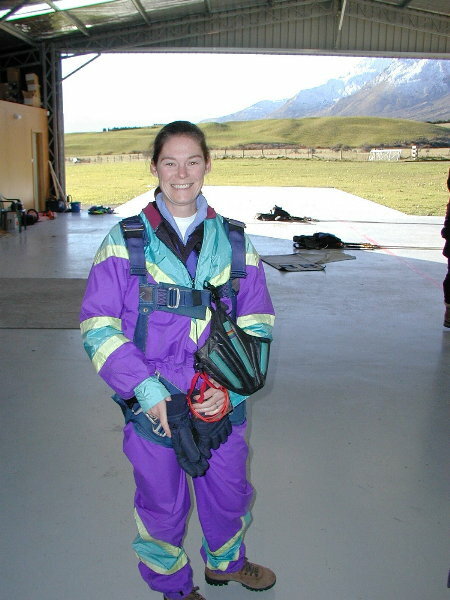 Kristen all suited up for her tandem sky dive in Queenstown. Kristen leading the way to the plane for her sky dive. 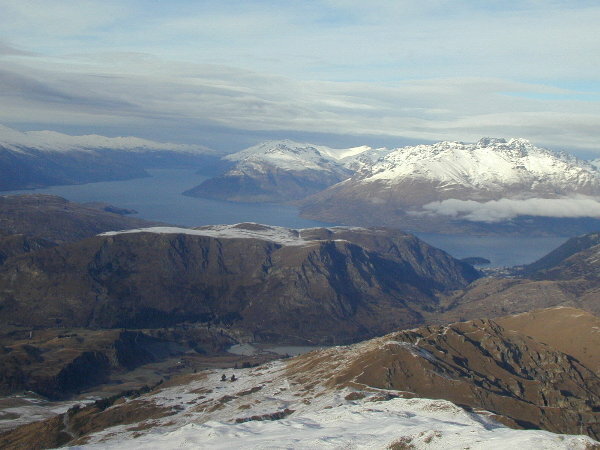 A view of the Remarkables range during Dan's descent. 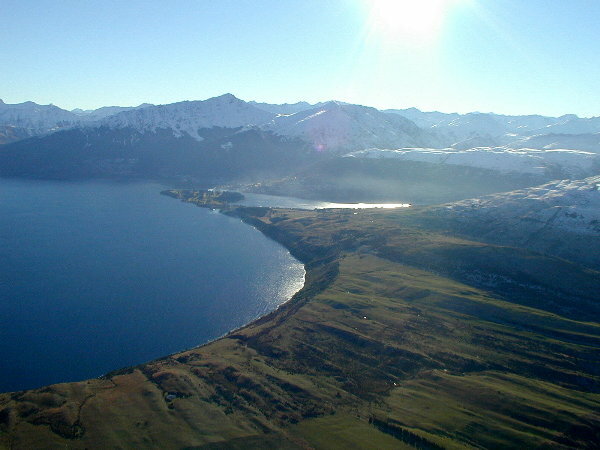 A view of Lake Wakatipu and Queenstown (behind the sun's glare) during Dan's descent. Dan looking down to the landing zone thousands of feet below. Dan's view of Kristen landing far below. We took a short flight to a cruise in Milford Sound. The gentleman taking our boarding cards took this picture of us -- he turned out to be the captain! View of Wakatipu lake from our plane to Milford Sound. View of small rivers at the end of Wakatipu lake in the mountains, from our plane to Milford Sound. View of Aspiring mountain range from our plane to Milford Sound. 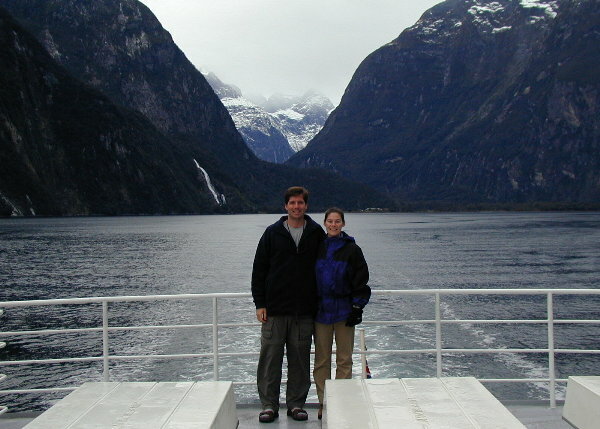 We are 'chilling' (literally) on the top of the ship as we cruised through Milford Sound. Panoramic view of Milford Sound from the boat. Cathedral Square, the main (and maybe only:) tourist attraction we saw in Christchurch, the largest town on the South Island. This view is from our hotel room. 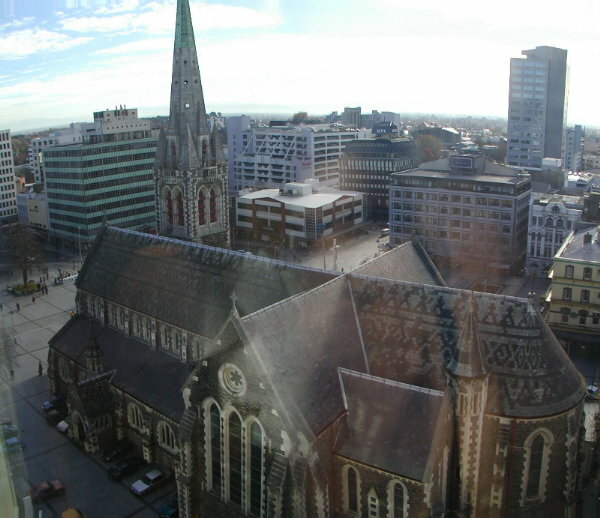 Dawn view of Christchurch from our hotel room. 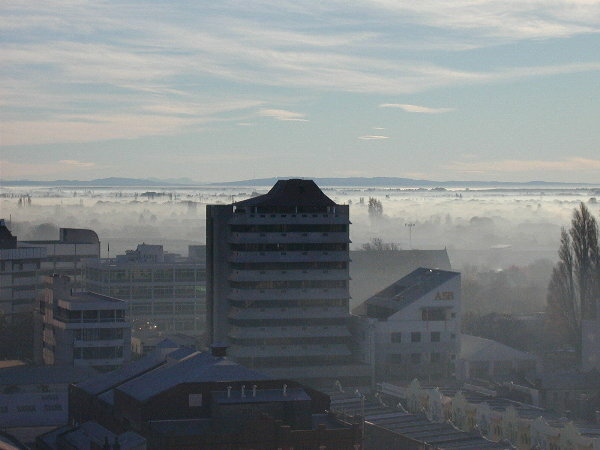 We thought the mist between the buildings provided a picture-worthy view. From Christchurch we drove a very scenic route along Banks Peninsula to Akaroa. We stopped along the way at Governors Bay. 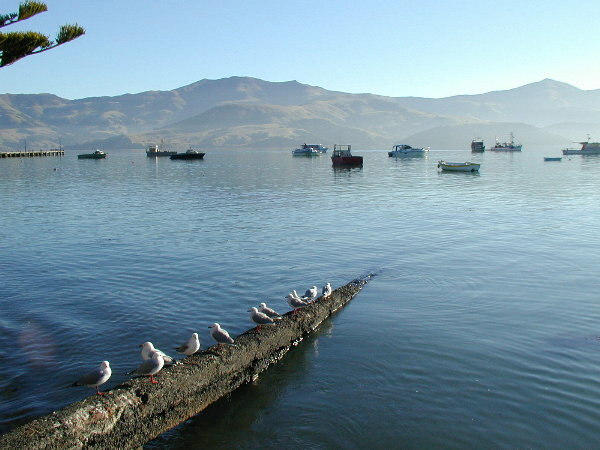 In Akaroa, a tiny, very quaint harbor town, we saw some awesome picture-perfect sights. 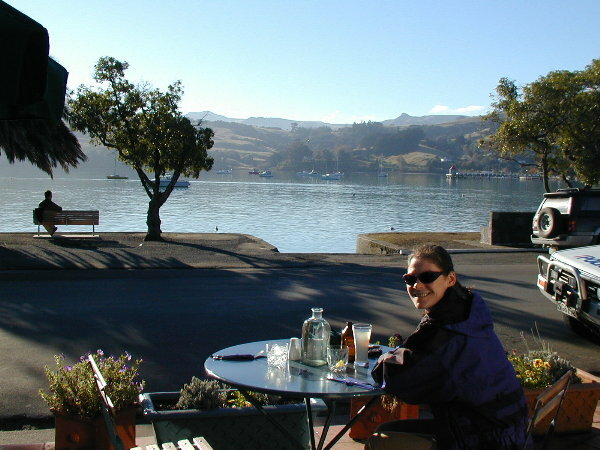 We had lunch at a little bay-side cafe in Akaroa. The food was as good as the scenery. After lunch, we did not want to leave Akaroa, so we ventured out to the wharf to enjoy the peacefulness. We relaxed on the wharf, enjoying the scenery, and talking with the local fisherman who, as we had come to expect in New Zealand, was extremely friendly . Our afternoon drive back from Akaroa to Christchurch provided us with some great sunsets. After we failed to see whales in Kaikoura the first time, we drove from Christchurch to Kaikoura to try again. 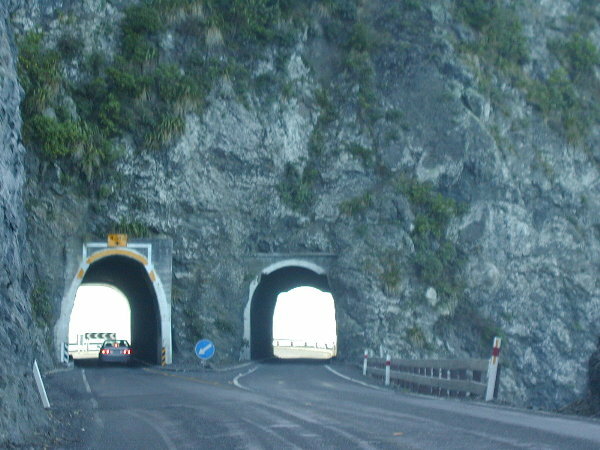 The drive provided typical beautiful New Zealand countryside as well as some interesting tunnels. The weather cooperated on this second pass through Kaikoura, and we (finally!) went whale watching. Fortunately we saw a few sperm whales. Unfortunately, this is about the only view you get of them, from the ecologically friendly whale watching outfit. But, we did get to see the infamous whale tail view as he headed down to deeper waters (these whales stay down about 2 hours). One of the coolest surprises of the whale watching trip, was the short ride through a pod of dolphins. They were everywhere! Although this was a small colony of "only" 400 dolphins, everywhere we looked we saw them jumping and playing. And to top off the second pass through Kaikoura, we even saw the seals we missed on the first pass. Although Queenstown is quite small, it has several options for about every type of food and entertainment we could want. When we were in Auckland we met a man vacationing with his family who highly recommended a pizza place called 'The Cow' in Queenstown -- it turned out to have the best pizza in the world. (Literally, it was the best pizza on our trip!) We also had outstanding Turkish Kebabs at a tiny shop in town. On our way out of town we enjoyed the view of the whole town and most of lake from the top of the gondola ride. This gondola went much higher than the one in Rotorua and provided great views on the perfect sunny day. Like Rotorua we found a luge ride at the top of gondola and could not resist trying this great ride again. 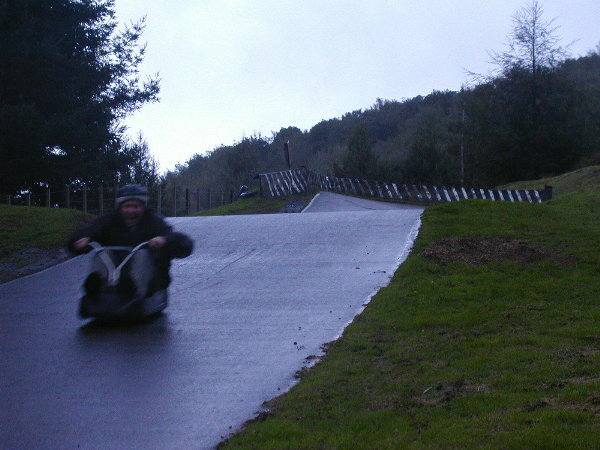 Without the freezing rain it was even more fun, although this track configuration was even faster and more dangerous. Dan decided to see if he could do the track without using the breaks (basically to see if it was as dangerous as it felt) and after running over the protective outer rubber flaps around curves and hitting the big padded walls, knocking his shins into the handle bars, and almost flying off the edge, he decided to start using the breaks again. We took a short 4 hour 'flight-cruise-flight' trip to Milford Sound from Queenstown. We had contemplated driving to Milford Sound to see the beautiful scenery of Fiordlands National Park. As we landed in the area we realized how small the town of Milford is (population 170), so we are quite happy with having taken the quick route. We would have liked to have walked the Milford Track, a supposedly outstanding four day walk from Te Anau to Milford through the mountainous region, but it is closed in the winter due to snow. The mountain ranges mixed with lakes and rivers were awesome on the flight over. The fiord (erroneously named a 'sound') is over 1000 feet deep and some of the stone peaks reach 1000's of feet straight up from the water. We started losing our 3-day streak of beautiful weather, and clouds moved in as we headed to the area, so some of the views were obstructed by clouds. 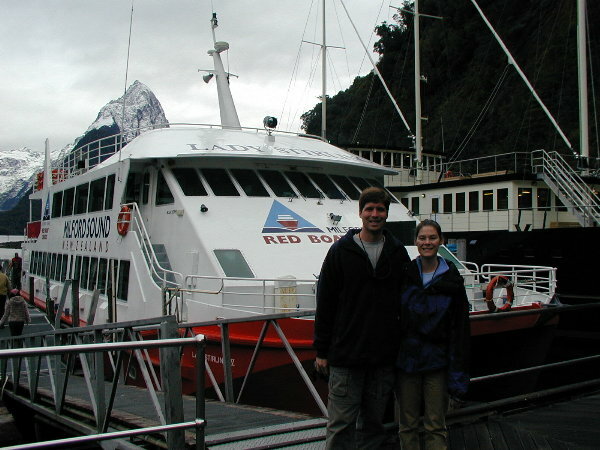 We enjoyed the 1½ hour cruise through the fiord in our huge viewing boat with a very cold open top desk but warm lower decks. We heard that the wind often reaches 160 mph near the opening of the fiord, but we think it reached no more than 60 mph during our trip (still quite cold). 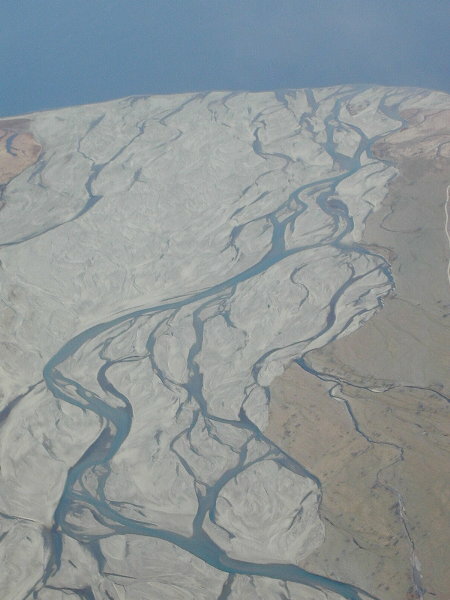 The captain explained every part of the fiord, as it seems someone has applied names to every large hill, waterfall, and odd make-up of the area. As the clouds rolled in we were told that there was risk of the planes being grounded and us having to take the 5 hour bus ride back to Queenstown. Fortunately, our pilot was waiting for us as we reached the airport, but he let us know that we were the last flight in or out of the area for that day and probably the next couple of days. As sad as we were to leave Queenstown we had to move on. We drove straight through to Christchurch, the largest town on the South Island. In fact, with a population of 300,000 Christchurch has 1/3 of all the people on the South Island. From what we read about Christchurch, we knew there was nothing very exciting to see in the city itself, so we took the opportunity to relax a few days, and take some excursions using the city as a base. For one day we drove 80 km to the end of Banks Peninsula to a tiny harbor town called Akaroa. The drive was beautiful as it took us along inland harbors and waterways most the drive. Akaroa is a quaint one-street town that looks out over a huge harbor across to the last green ridges before the open ocean. We ate lunch at a great outside cafe by the water, then sat on the end of a pier and talked to a very nice local fisherman. As usual, he was super nice and very happy to talk to us, suggesting places to drive around the area, and telling us stories about the 'old times'. 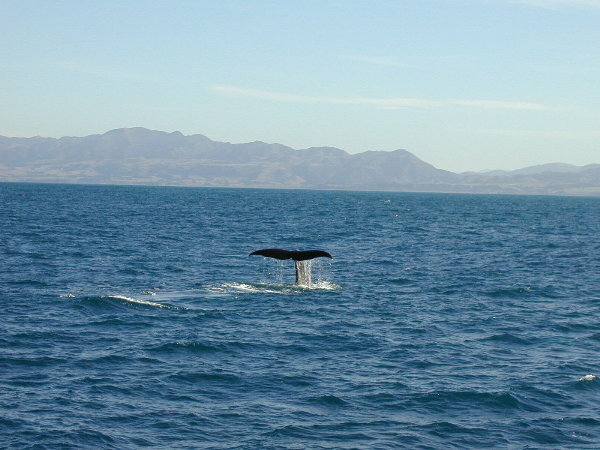 Because the weather was good, and Kaikoura was only 180 km from Christchurch, we decided to attempt whale watching again. We woke up early and called Kaikoura Whale Watch to see if the morning whale watching boat had gone out. They confirmed that it had and that the weather was good, so we made reservations on the noon boat and jumped in the car. We arrived in Kaikoura early, and enjoyed lunch at one of the cafes we had wanted to visit but missed on our first stay in Kaikoura. We purchased sea-sickness pills (just in case) and met the whale watching boat at the dock. The trip out to the deep water was pretty rough as the large 150-person boat toppled huge rolling waves -- we cannot imagine what it would be like on a rough day. The crew is quite adept at whale searching, using radar and well-practiced manual techniques to find the few whales in the vast area. We were fortunate to see three different whales. Although we did get fairly close to some of the whales, we could not see the whales very well because almost all of their bodies remained underwater, and they rarely raise out of the water. After several minutes of watching each whale, the crew person would yell 'get ready, it's about to dive', and then the whale would raise it's tail out of the water before diving down to the deep water. Because there is not much to see most the time, the whale tail is the picture to get for a Sperm whale. Two days later we saw in the Christchurch newspaper an amazing picture from the same whale watching trip the next day of two Sperm whales with their heads raised way out of the water with huge fish in their mouths -- a very rare picture opportunity that we missed by one day! On the way back to shore the captain took us by a relatively small dolphin pod of only 400 dolphins -- supposedly a pod can be as large as 2000 dolphins. 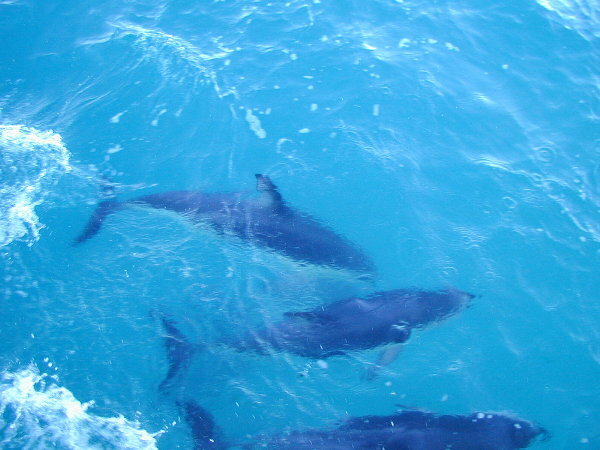 We were not sure what to expect, since we had never seen more than a few dolphins at a time. We were amazed at the constant activity, almost frenzy, of dolphins everywhere. Looking over the side of the boat into the water we could see tens of dolphins swimming along with the boat, playing, criss-crossing, and rising out of the water. Against the horizon we saw tens of dolphins jumping high out of the water. Sometimes the same dolphins would jump ten to twenty times. The visit to the dolphin pod was definitely the coolest part of this boat trip! On our first visit to Kaikoura our visits to the seal colony on the peninsula had revealed no seals. 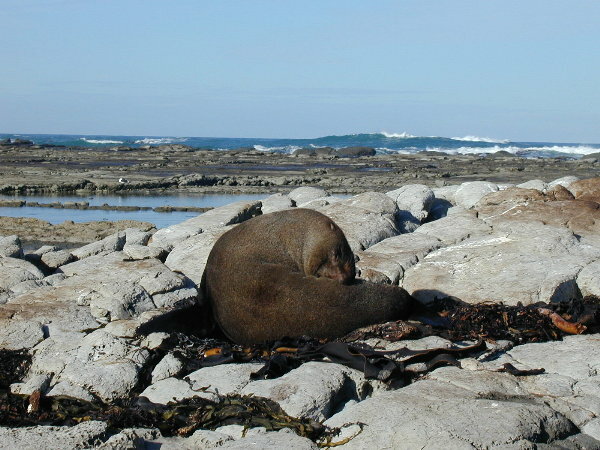 But when we stopped by the same place this time, we saw some lazy seals basking in the sun. Funny that on the first visit of two days to Kaikoura we did not have any success, but on this three hour visit we saw seals, whales, and dolphins! We flew to Auckland from Sydney as part of the Boomerang Pass we purchased in Hong Kong. You have to commit to at least two intra-Australia/New Zealand flights on Qantas airlines before you reach the continent, and you get up to 10 significantly discounted flights within Australia and New Zealand. We thought we would fly more within New Zealand before we realized how close everything was and how easy the driving would be. So we only used the required two flights on the Boomerang Pass, but we think the flights were cheaper than if we had shopped around for flights upon arrival in Sydney. We rented a car from Avis in Auckland, drove 1400 km around the North Island, returned the car in Wellington, took the ferry across to the South Island, picked up another car from Avis in Pickton, and drove 2400 kilometers around the South Island. When we picked up the second car, we learned that although we effectively had two rentals we could include both on one contract and pay once at the end. By combining the rentals we received a 21 day rate instead of two shorter period rates. Heritage Auckland Website Top quality hotel. We stayed in the executive suite on an internet deal, and it was great. Outstanding modern apartment/hotel with best ocean view in town. Ask for #7 for best view. If you really want to stay here, go through Otorohanga, and look on right side of road. Typical roadside motel on the main highway. Not much to choose from, don't expect much. sirocco@spiralinvestments.co.nz Great restaurant in Rotorua. Mixed menu. Very nice hotel on the main street, near the Te Papa museum. Great weekend discounts, otherwise quite expensive (NZ$165). The only 5-star motel in town, and the only one we found with view of water not blocked by the trees lining the water. Very nice/modern, but you pay for it (NZ$165). Ok hotel, but could probably find better. Does have internet access in hotel, though. 5 minutes from town center (pretty far), but can get decent room with great lake/mountain views pretty cheap (NZ$120). Right in the city center (literally), it is nicest hotel we stayed in for under US$70, and included breakfast.